I freaking love Target. 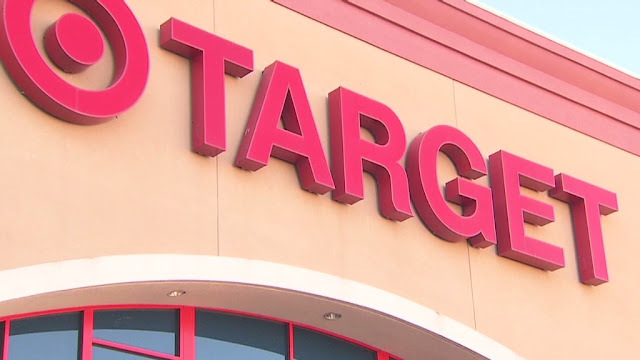 Spending an afternoon at Target makes my weekend complete, I swear to you, but it is also basically the worst thing I can do for myself outside of like hard drugs or something. This Sunday I didn’t have much going on, so I drove myself the ten minutes down the road to hit up my local Target. 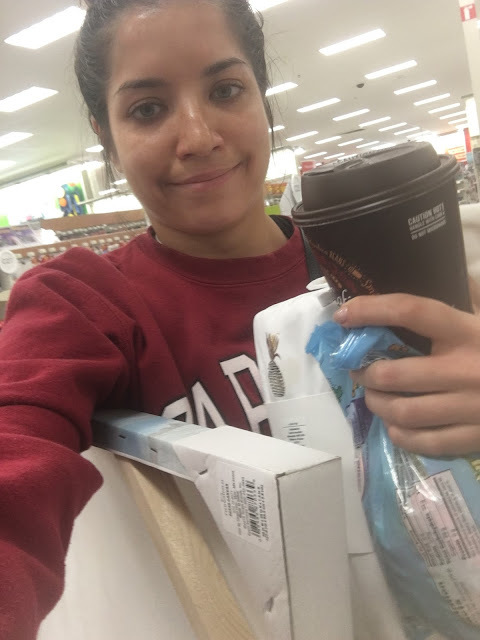 I stopped at McDonald’s on the way to get a Shamrock Mocha to “save money” off the one I would have surely purchased after stepping into Target. Now, I don’t usually do caffeine, so when I do MY GOD IT IS LIKE EVERYTHING IS BRIGHTER AND MORE SHINY AND VIBRANT AND BEAUTIFUL. This is precisely how things were on this day. Bear in mind, I did not need one. single. item. I did not grab a cart. I did not grab a handheld basket. I was there to enjoy the ride and maybe buy a bag of gluten free pretzels I’d forgotten at the grocery store the day before. I go into the clothing section. First of all, swimsuits are all out for the season and my god I love swimsuits. I’m an addict. And now that Victoria’s Secret doesn’t sell them anymore Target is the only place I can get my fix. Then all their tanks and tees were on sale for $5. FIVE DOLLARS. I text my roommate and she rejoices with me and says BUY ME SOME NOWWWWW. I am now carrying several tanks and tees around with me, plus my not-Starbucks. My saving grace is that the clearance clothing section is remarkably picked over (I DID manage to find super soft turtlenecks for literally $4 here last week though! ), but no matter. BECAUSE THE REST OF THE STORE IS BASICALLY ON SALE. All Easter candy is 2 for $5. That is almost no money!!!! I grab Nerds jelly beans and continue on my way. It does not matter that they regularly retail for $2.69 and are therefore only $0.19 off. They are on sale and they are made of sugar and it’s almost Easter so Jesus wants me to have these jelly beans. It’s a religious experience. I go to the food aisle for the gluten free pretzels I’m after/actually probably here for. They do not have them. I look to my right and what do I see? THE HOME SECTION. OH MY GOSH THE HOME SECTION. Everything matches everything. Everything is beautiful and accented with gold and only $24.99 because it’s Target, duh. Never mind that I am moving in May and already have way more crap than I would ever hope to move in my life. Never mind that I have no idea where I will be post grad and do not yet have a job because I see the large canvas painting I had my eye on months ago. It hasn’t been restocked since and it is even more glorious than I remembered. I reason with myself. I pull out my Cartwheel app to scan it to see if it is on sale. It is not on sale. It is $64.99 and essentially the only thing in the entire home section not on sale. I stare at it longer. I pet the canvas like it is a dog. The caffeine from that not-Starbucks is really kicking in. I am WIRED. You do not have a job Kelsey. 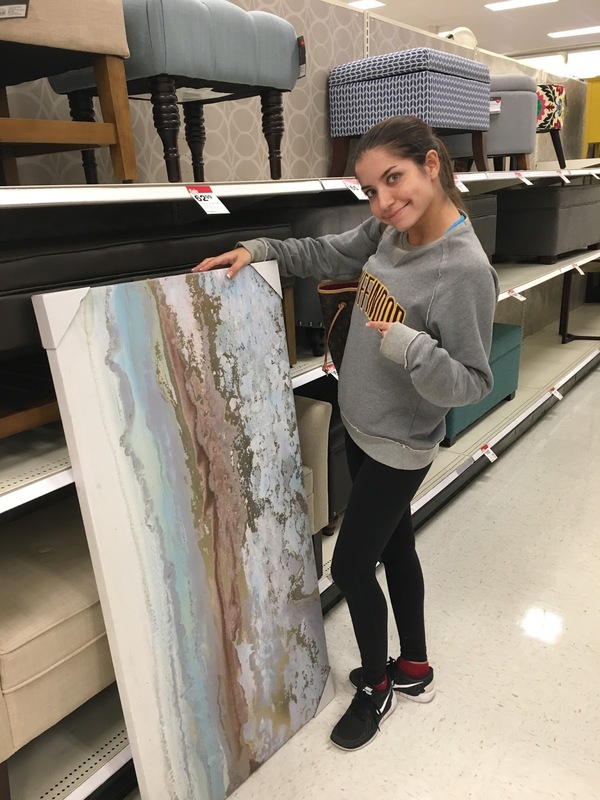 You do not have a job or an apartment that goes along with said job that will allow you to house this painting. I am now carrying tanks, tees, Nerds jelly beans, this giant painting, and my money saving not-Starbucks. 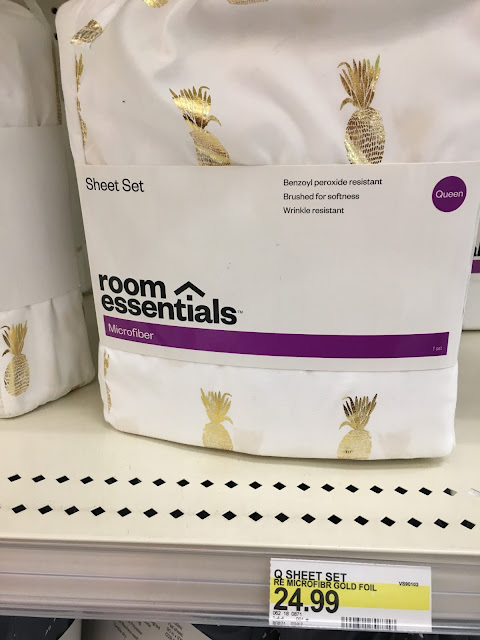 Then I come across super ultra soft sheets with golden pineapples on them for $24.99. I do not even argue with myself. I simply admit defeat and take them with me. I then decide I must forcibly extract myself from the store. I am in way too deep and the only way to help myself is to get myself out. 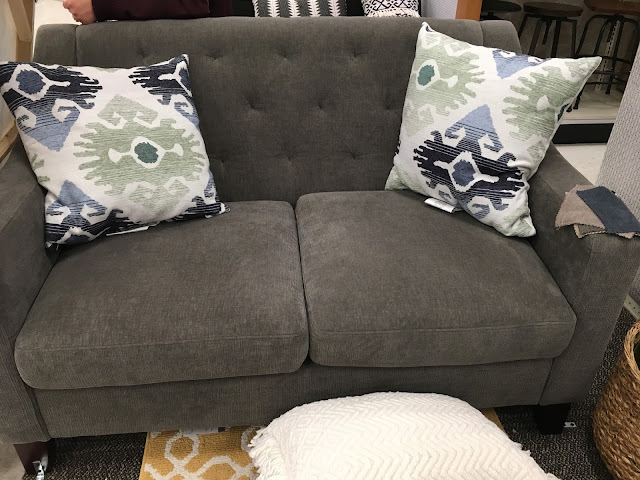 I pass a couch on my way that is on clearance for $214! It is perfect for my roommate who did indeed just get a job and will soon enough have an actual place to furnish. I shift my millions of items around in my arms and find a way to take a photo for her. My caffeine high hits a new level and I set down all of the things in my arms on the ground and run over to the pillow aisle to completely restyle this couch in the middle of the store to send to her. I appear maniacal. A Target employee approaches, concerned that I am a psycho. I explain the caffeine + couch sale situation and she nods her head and grabs me a cart. She sees this insanity every day. I have my phone out, shooting pictures of this couch like I’m a photographer out of Better Home and Garden. I feel like Joanna Gaines, stylist extraordinaire. Feeling like queen of the world, I shove all of my things into my newly acquired cart and head for the register. 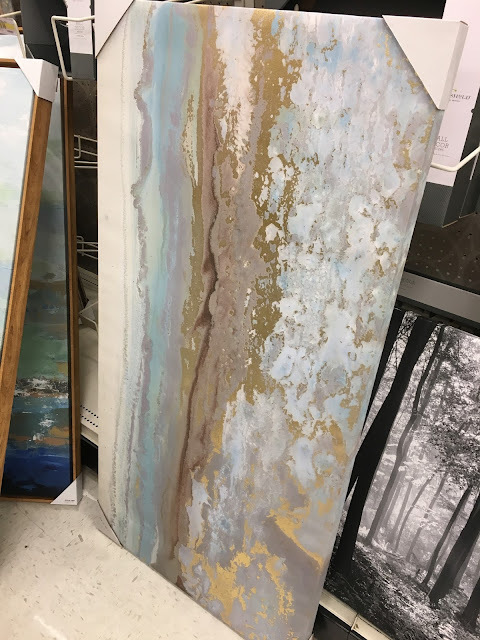 $115 later I am headed to my car and back home, where I remove everything from the shelves of my closet to fit my painting. I apply to somewhere in the realm of 50 jobs, the caffeine kick not ceasing a bit, because I have this painting now and I certainly cannot let it down. My mid-afternoon not-Starbucks means I am unable to fall asleep until 4 am, but I am pleased with myself nonetheless. Best day ever. Side Note: Found a Target gift card I’d forgotten about in my wallet today, so guess who will be back next weekend! Please say I'm not alone in this insanity.